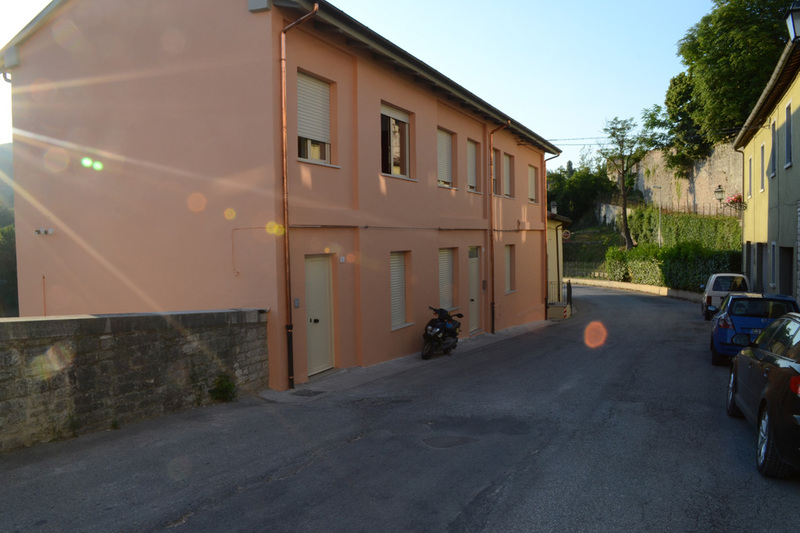 It is mid-afternoon in Cagli, Italy, and the Bocciodromo is filled with older gentlemen. The Boccidromo is in a newer part of the ancient city (circa 1960’s). Some of the men are playing bocce while others play cards, drink wine, or talk politics. 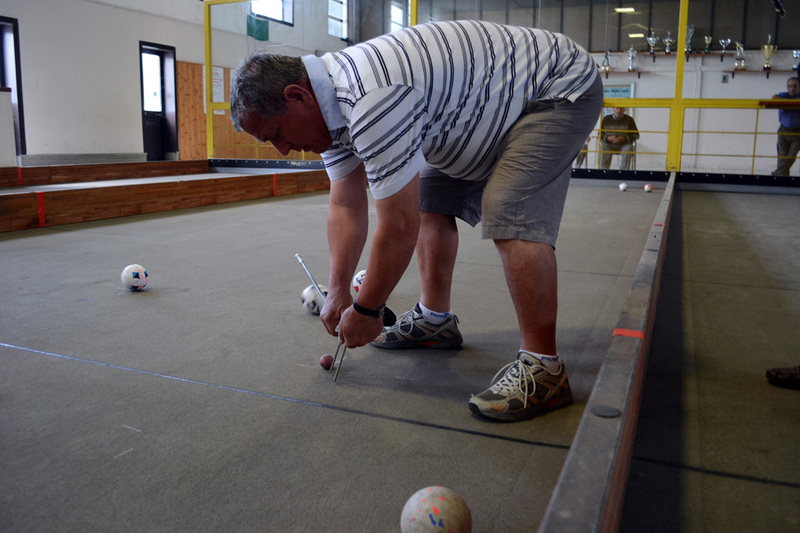 In one of the bocce lanes, Franco Tornari pulls out a metal stick and measures the distance between the bocce ball and the pallino or little ball. He is careful to get a good measurement. 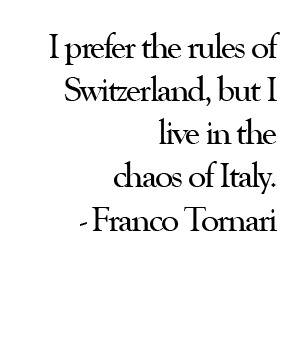 The men anxiously await his call, and when he makes it, a disagreement ensues. After they reach accord, the men disperse and watch as the next player rolls the bocce ball down the lane. 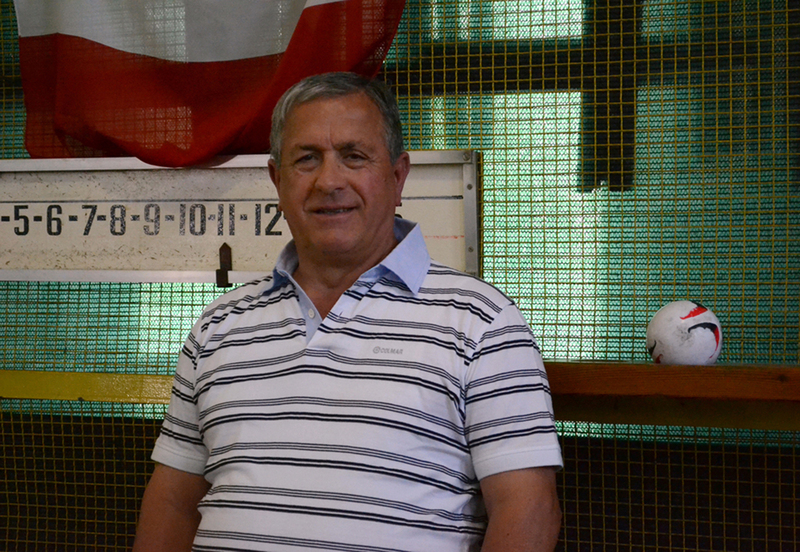 Franco, a member of the club since 2007, has a passion for bocce, an Italian game similar to lawn bowling. However, his friends’ companionship makes him love the game more. The club is a place of “friendship, companionship, and hanging out together and chatting,” he says. He also likes a “good-natured argument,” which happens each time they debate a shot and determine points. 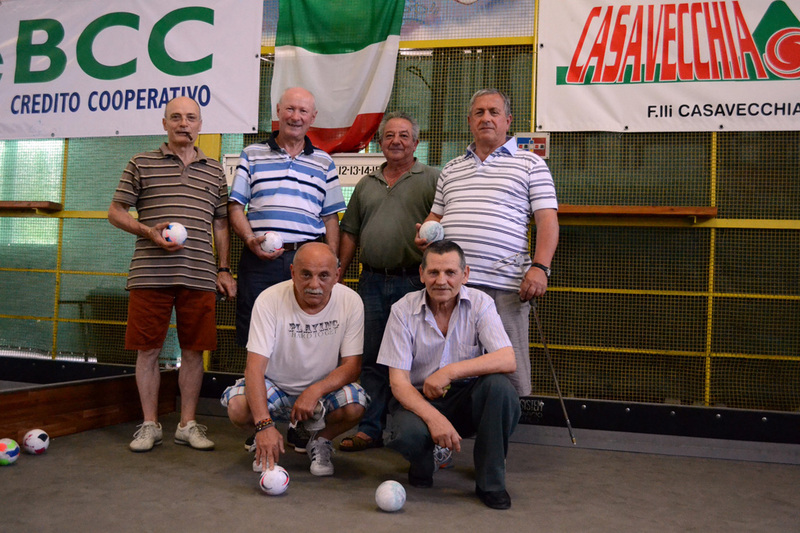 The members are referred to as bocciofila – friends of bocce. The Bocciodromo – Greek for round balls – was built in the early 1980s. Various trophies and competition flags adorn the space that the 250 members share; it is a place of joy. In 1996, the Cagliese team played in the World Championship in Austin, Texas, and club members are proud of their role in the historical event. 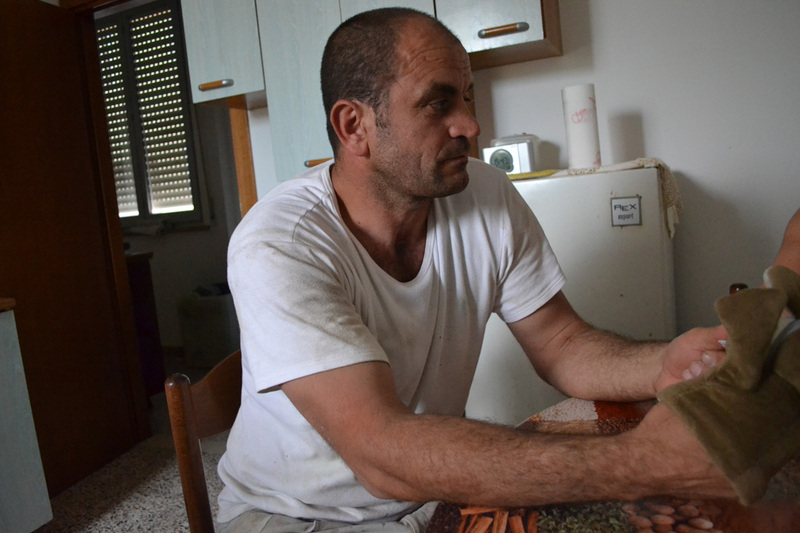 Bocce became part of Franco’s life in the 1970s when he lived in Switzerland. 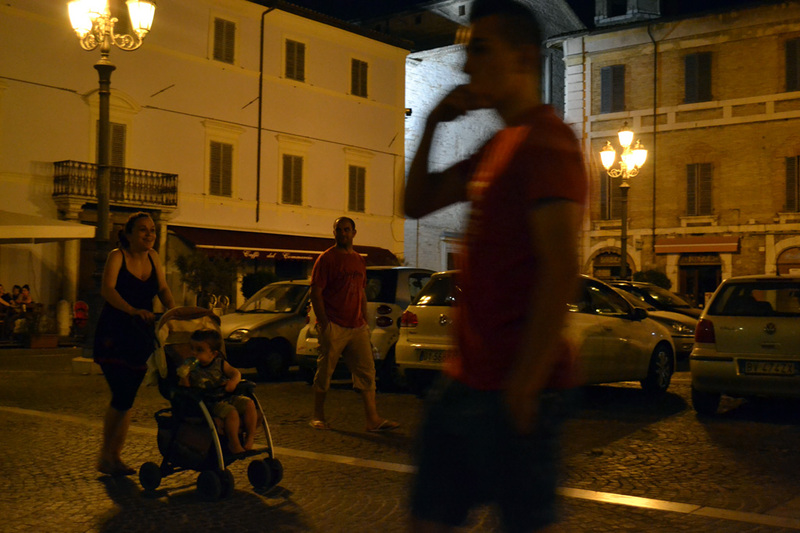 For years after World War II, Italy’s economy suffered, and he moved to Gallo, a Swiss city where residents speak both Italian and German. 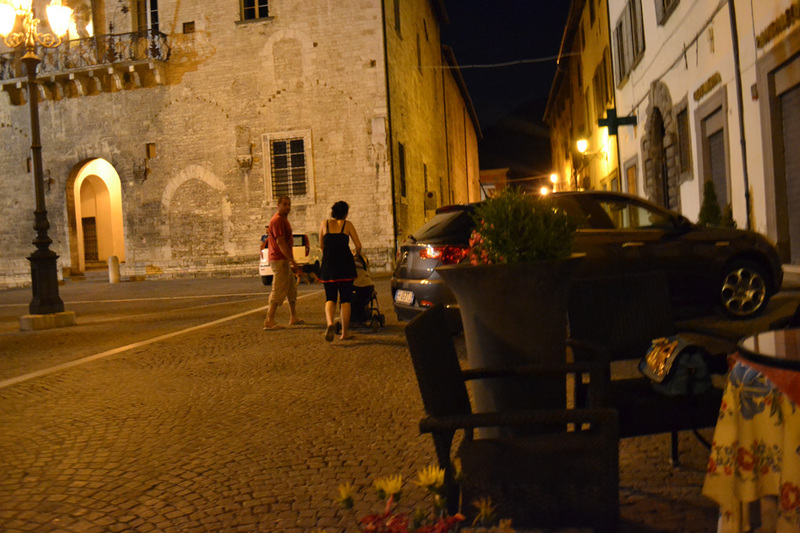 He worked as an auto mechanic for companies such as Buick, Chrysler, GM, and Hyundai, and eventually met his wife who hailed from the Dolomites, a mountain range in northeastern Italy. She has since passed away. In Switzerland, he enjoyed the camaraderie of other Italians who lived in the country that Franco says is “bella” or beautiful. 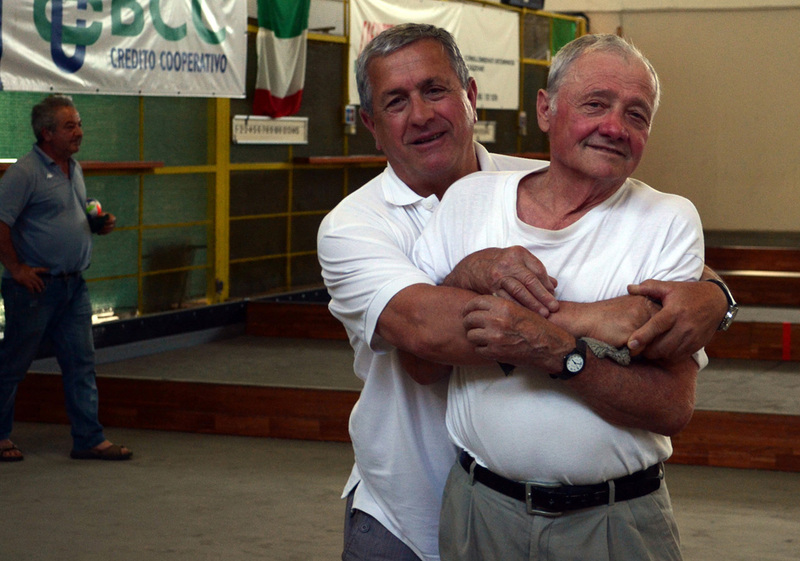 After retiring in 2006, the Cagli native returned to the place that he loves so much – Italy. In 2007, he joined the club and hangs out there daily. He rides his motorino (or scooter) to the club every day. He also enjoys cards and often can be found at the club playing Briscola 3-7 (an Italian card game) and drinking wine with friends. The turquoise bar, terra-cotta walls, and smiling, older gentlemen make the club warm and inviting. 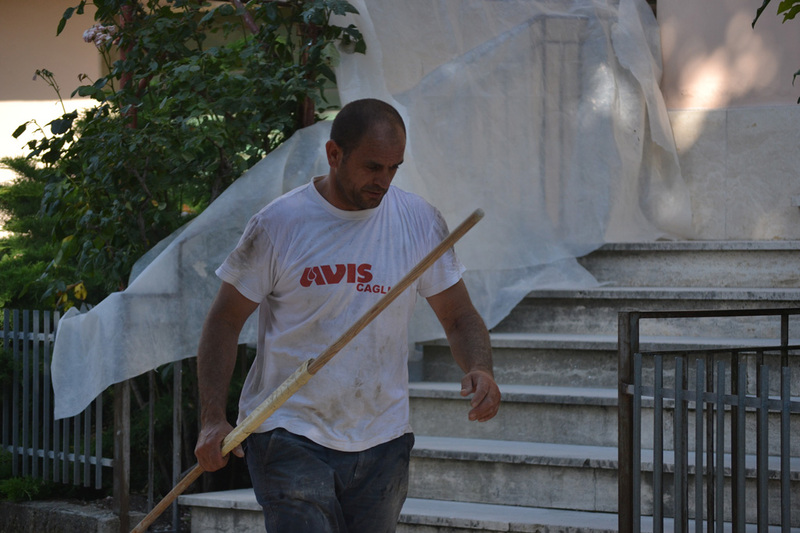 The game begins with the rolling of the pallino. 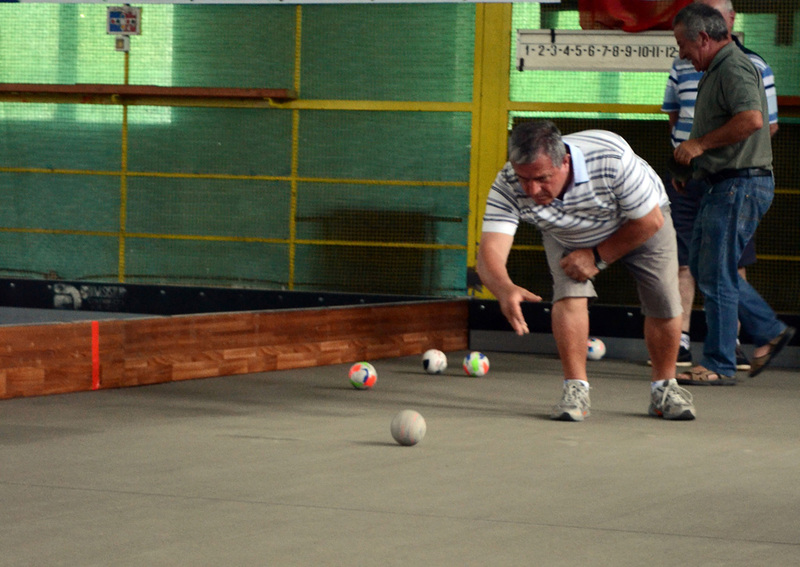 The first player rolls his bocce ball, trying to get as close to the pallino as possible. The players hope to knock their opponents’ balls out of the way. 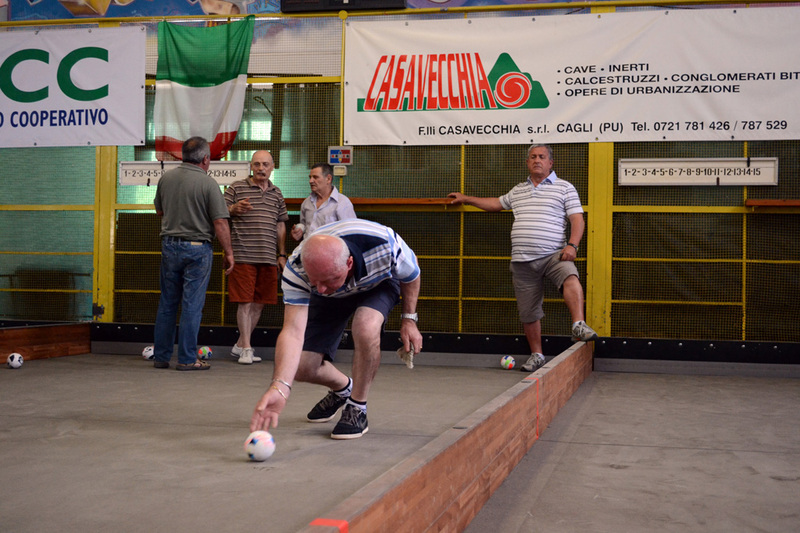 The action gets heated when a player rolls the ball at top speed, sending it into the air over the other balls, displacing some as it hits the ground and careens toward the pallino. The players rush to the end of the lane to see the outcome and debate the points. 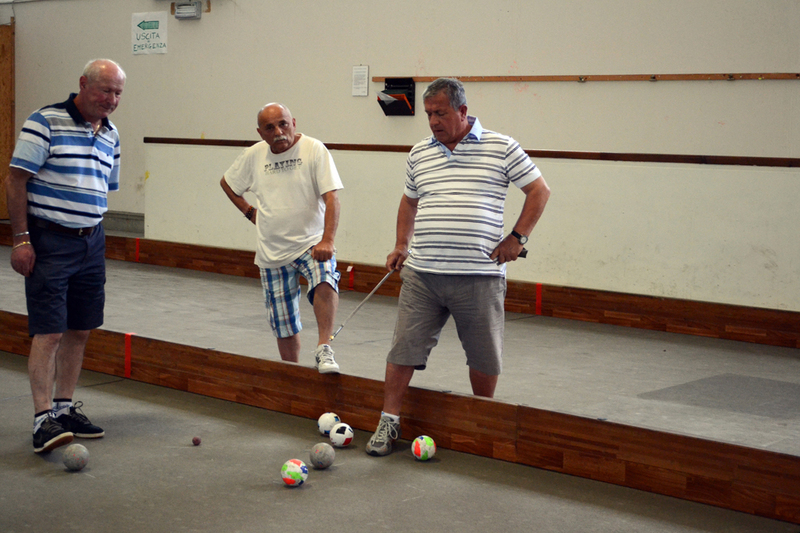 Bocce is a “little different here to there,” but the Swiss version is similar to the Italian one, Franco says, adding that in Germany and Switzerland, the players are more serious about the game. Franco appreciates the two countries. 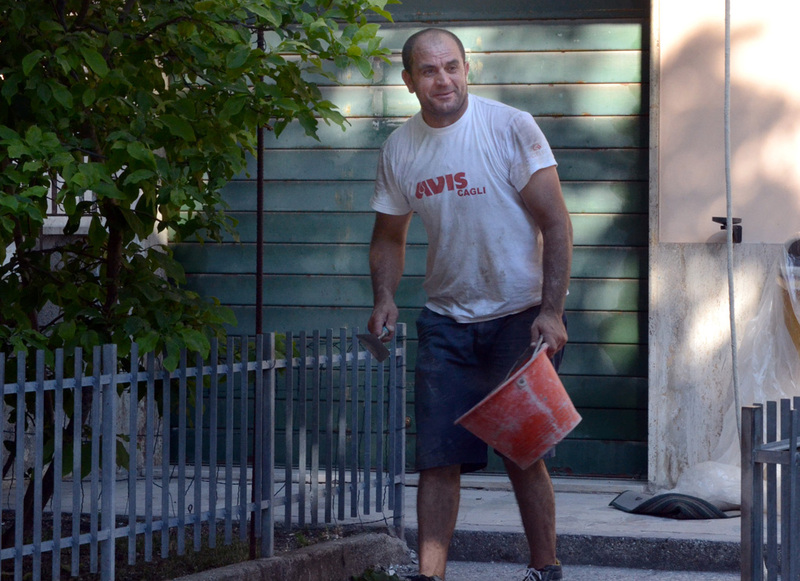 He has a Swiss retirement account and two houses in Italy. And he gets to hang out with his pals — the bocciofila of new Cagli.